Vernon Smith, 37, was put to death with a single dose of sodium thiopental Thursday morning in Ohio. 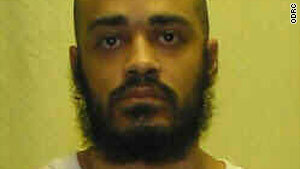 (CNN) -- Ohio has executed its second inmate using a new one-drug method, officials said Thursday. Vernon Smith, 37, was pronounced dead at 10:28 a.m., according to a statement from the Ohio Department of Rehabilitation and Correction. Smith was convicted of killing Toledo, Ohio, store owner Sohail Darwish during a robbery in 1993. According to court documents, Darwish did not resist Smith's orders to open the cash register and hand over his wallet, but Smith shot him anyway, saying he "moved too slow." Darwish bled to death from a single gunshot wound to the chest, the documents said. Darwish, a 28-year-old from Saudi Arabia, had a year-old daughter, and his wife was pregnant with another daughter, the Columbus Dispatch newspaper reported Thursday. The execution was Ohio's second using the one-drug method. Kenneth Biros, 51, was put to death in December. It was Ohio's first execution since September, when Gov. Ted Strickland and federal courts halted capital punishment in the state after a botched attempt to execute another prisoner, Romell Broom. The prison staff could not find a suitable vein for Broom's lethal injections. The one-drug method used on Biros had never been tried on U.S. death row inmates. It relies on a single dose of sodium thiopental injected into a vein. A separate two-drug muscle injection was available as a backup, officials said. The one-drug method has been used to euthanize animals. The same drug, sodium thiopental -- but at a much lower dosage -- is the first ingredient in the three-drug method previously used in Ohio, as well as in all but one of the other 34 states with the death penalty.